How many people will be there? What content do I want to display? How will the room be oriented? These are some of the questions you need to be asking yourself when choosing screens and projectors for your event. We want to give you some guidance by taking you through how we picked these items for one of our recent projects! 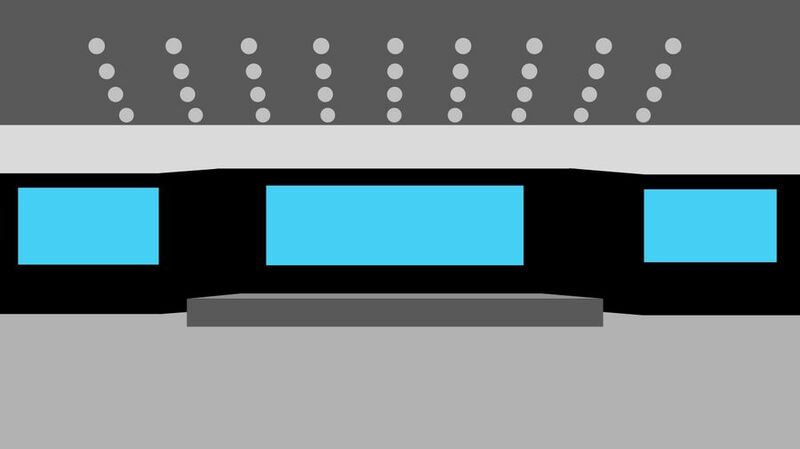 The first thing you want to consider is audience size. A bigger audience means larger screens and may require multiple screens. For example, if 500 people are in attendance at your event, you might choose two smaller screens, in the 12’ wide range, or you might want to opt for a single, larger screen, like a 16'. For this project, our client was expecting 2,000 people in attendance. We chose a pair of 11’3” x 20’ Stumpfl rear projection screens to ensure that everyone in the audience had a clear view of the screens’ content. Now put yourself in the shoes of audience members in the back of the room; they rely on the screens to show them live footage of speakers and anything that is happening on stage. To ensure that they can see this footage, you need to know if your room will be set up with a wide orientation or a long orientation. The room for this event was set up with a long orientation, so not everyone was close to the screens and that’s why they needed to be bigger. However, if the same room would have been set up the wide way, two 16’ side screens would have been sufficient. Your screen size should be big enough so that the farthest person away can clearly see what is being displayed. Your screen size will determine what projector you should use. For 12’ screen we recommend a range of brightness from 8,000 - 12,000 lumens. With 16’ screens you can go from 12,000 - 20,000 lumens and so on. A variety of factors impact which specific projector you should choose within these ranges, the most important being ambient light in the room. 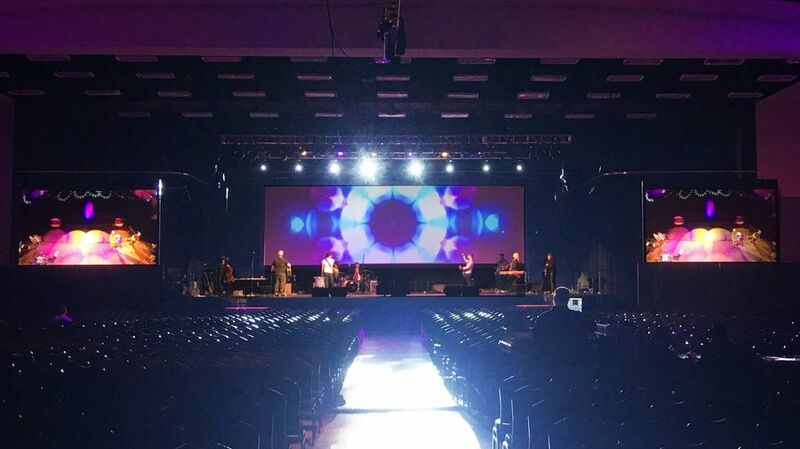 In this case, because TSV was providing a full-service production with complete control of the lighting, we were able to make the areas around the screens very dark, and we were able to use Epson 15,000 lumen laser projectors to fill the 20’ wide screens. In a room with more ambient light, we probably would have needed to go with at least 20,000 lumens of brightness for these large projection screens. We wanted to do a full backdrop on the stage, but with a 40’ wide stage and short ceilings, we knew the screen was going to have to be an odd size. With any screen, like the 12’ x 40’ custom screen we used for this project, it is critical to consider your aspect ratio. Aspect ratio is the proportion of width and height of an image projected onto the screens. You’re probably already familiar with the concept of aspect ratios, even if you don’t know it. If you’ve ever looked at a square photo (like an Instagram photo) on your computer in full screen, you’ll see that the image doesn’t fill the screen, and there are black bars on the sides. That’s because you’re looking at a photo with a square (1:1) aspect ratio on a rectangular (16:9) aspect ratio screen. Most modern equipment, such as laptops, flat screen TVs and HD projectors, are in a 16:9 aspect ratio. This means that in the normal case, when we are designing content for an event, we are most often formatting our videos, powerpoint slides and images at 16:9. But this big central screen threw us a curveball. A 12’ x 40’ screen is a 10:3 aspect ratio, and that meant that all of the content had to be designed from scratch to fit the screen perfectly, without black bars on the sides, or overshooting at the top and bottom. And because the aspect ratio of the high-definition laser projectors we used have a 16:9 aspect ratio, we used two of them, with each one filling half the screen. We then used a video mapping software to perfectly fit the odd projection canvas onto the odd screen, and ended up with an incredible ultra-wide display. If you have questions about choosing a projection screen for your upcoming events, don’t hesitate to contact TSV today!